After stunning snow, followed by Spring sunshine, London today resumed normal services and only ceased drizzling to tip it down at regular intervals! This meant arriving at the theatre with squelching wellies and dripping hat, and In need of cheering up! This was the first time I’ve seen an actual ‘stage’ inside the Jermyn Street Theatre. The studio accommodated it well and it split the space interestingly. The set (designed by Rebecca Brower) gave little away about the continental escapade to come, as we waited for the lights to dim, it felt like we were assembled in a country church hall. The journey that follows takes us through countries that do not exist, but which mirror Europe in the 1930s, with its monarchies and corruption and growing unrest. It is a madcap, fast paced trip to say the least! 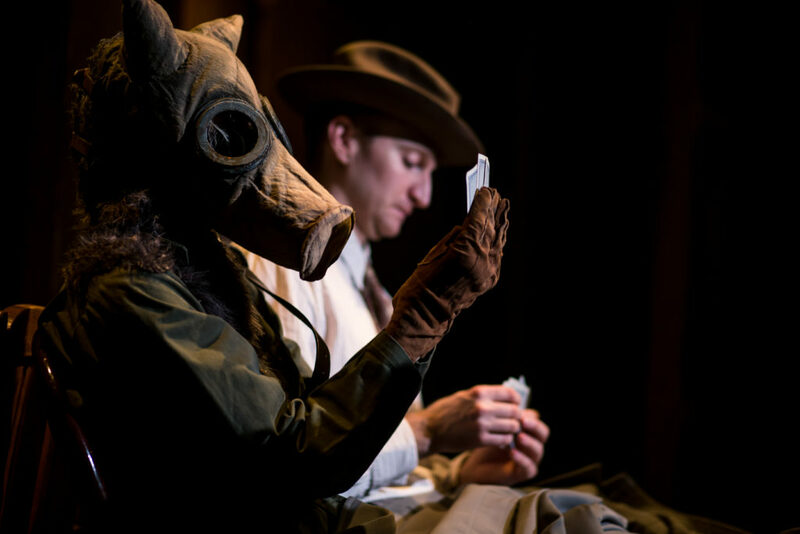 The thought provoking satire of society and politics between the wars is a constant bubbling amusement that frequently fizzes into outright laughter. The story, although it twists and turns all sorts of corners, remains a basic chase. The script (by W. H. Auden and Christopher Isherwood) is more poetry than prose and changes pace throughout. The remaining cast (Edmund Digby Jones, Eva Feiler, Rujenne Green, James Marlowe, Suzann McLean and Adam Sopp) has multiple roles to play, each with a lot of lines to deliver, which they do beautifully, in song, in rhythm and with gusto. They shift both scene and actual scenery fluidly, as props and backdrop alteration are woven cleverly into the action. The ever changing lighting (by Catherine Webb) sets the tone, pace, and atmosphere for each scene, and the quick-changing cast are masters at flitting in and out of character. A lot is packed into this production. The tale gallops across countries, in and out of hotels, brothels, hospital and prison. It travels by train and boat, meets villains and comrades, and steers our hero towards home. The story offers echoes of 21st Century political and social division: Of derision of ‘experts’. Of countries divided. Of hope for a fairer future. The show is very good; the action doesn’t lull, I laughed aloud, the cast is engaging and my fellow audience members were grinning throughout. And despite the familiarity of ‘the hero seeking the almost impossible task to win fair maiden’, there are many moments of unexpected sidetracking that are novel and entertaining.